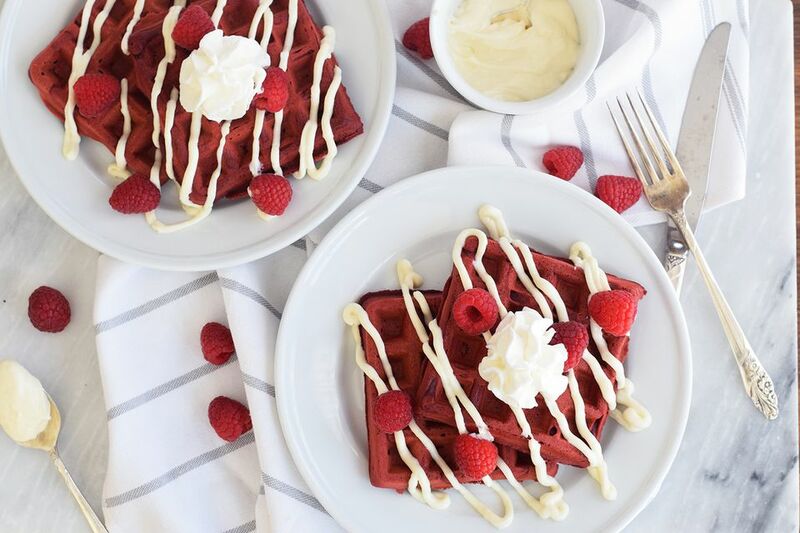 Sweet and dreamy, these red velvet waffles make the perfect romantic breakfast. They fit right in on Valentine's day or Christmas, but after trying them you may want to make them year round. Their a rich chocolate flavor goes perfectly with a drizzle of creamy icing. Red velvet is traditionally chocolatey and we took that history to heart. These waffles have both bittersweet chocolate chips and dark cocoa to make sure the chocolate really shines through. There aren't a lot of ways to replace the red food coloring, but you can leave it out if the red color is not important to you. Whisk together the flour, sugar, cocoa powder, baking powder, and salt in a large bowl. Then set aside. Melt the chocolate in a small microwave-safe bowl. Stirring every thirty seconds until it is completely smooth and melted. Cool slightly. Whisk the melted butter, eggs, milk, and vanilla together with the melted chocolate. Whisk in the red food coloring until you reach the desired redness. Gently mix the wet ingredients into the dry ingredients. It is ok for the batter to be lumpy, but make sure that there are no large pockets of flour. Scrape down the sides of the bowl thoroughly with a rubber spatula. If you want it darker or redder, add more red food coloring. Heat your waffle iron and pour the batter into the iron. Cook until your waffles are crispy. Remove them from the iron and keep them warm in a 200 F oven until you are ready to plate and serve. While the waffles are cooking, prepare the cream cream icing. Whisk together the icing ingredients until completely smooth. Drizzle the icing over the waffles and top with whipped cream and berries. Enjoy! Try to find gel food coloring, which provides deep color without adding a lot of water. You will need fewer drops if you use gel, so keep this in mind when adding it. Make sure your butter and chocolate has cooled slightly before whisking in the eggs to avoid scrambling the egg! If you're looking to save some time, use a store-bought cream cheese frosting (in a can) place it in a baggie, snip off the end and frost it over the top of the waffles.